DOLCE & GABBANA SUNGLASSES DG6109. CORAL RED PLASTIC, RED SEQUIN TRIM DETAIL. A STANDARD CASE WILL BE SUPPLIED. 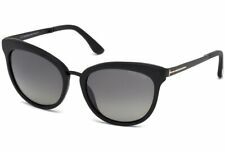 Bvlgari Sunglasses BV8218B 501/8G Black Grey Gradient are an elegant cat eye design featuring slim metal temples, embellished details with the circular hinge and the Bvlgari logo engraved next to them. Tom Ford Sunglasses 0575 Anna 01B Shiny Black Grey Gradient are effortlessly elegant cat eye style sunglasses. They're on trend this season with a prominent metal brow bar that matches the metal temples. The thick plastic front and oversized lenses provide a glamorous look and the Tom Ford T wraps around each corner to provide instant brand recognition. Miu Miu Sunglasses Pink Gradient. Condition is Used. Dispatched with Royal Mail 1st Class. Comes with out box. Polaroid Sunglasses 4016/S D28 WJ Shiny Black Grey Gradient Polarized feature a metal bar across the top brow bar which adds a unique luxury finish to these lovely women's Polaroid sunglasses. The polarized lenses will reduce glare which in turn reduces eye fatigue and much less squinting into the sun!. TOM FORD EMMA SUNGLASSES BORDEAUX STRIPE RUTHENIUM MAUVE GRADIENT FT 0461 71F. TOM FORD Emma Sunglasses Model: FT 0461 71F - Made in Italy. Model: FT 0461 71F. Lens: Mauve Gradient. The History behind Tom Ford: Tom Ford, arguably the most powerful man in fashion, originated from Gucci. Lacoste Sunglasses L834S 214 Havana Brown Gradient are a lovely feminine cat-eye style, with acetate front frame and slim metal temples that feature a unique cut-out pattern along the arms. Prada Sunglasses 13QS 2AU6S1 Dark Havana Brown Gradient are a highly sought after pair of sunglasses with a hugely popular silhouette that is in demand across the fashion world and a number of brands adopting this style with Prada amongst the leaders. Top metal brow bar and bridge match the metal temples for a unique truly sophisticated look with a really cinematic luxurious finish. Police Roberto Cavalli Marc Jacobs Giorgio Armani Bulova Tom Ford Handbags Prada Sport Christian Dior Gucci. Bridge Size13mm. Lens ColourSmoke Grey. IncludedTom Ford Case, Cloth & Authenticity Card. PolarisedNon Polarised. Hugo Boss Sunglasses 0576 2LL HD Purple Fade Grey Gradient are just simply gorgeous, the wayfarer style frontage is given a cat's eye teak at the corners and this then blends effortlessly into the well matched colour metal arms and then back into the plastic temple tips in the same colour as the front frame. 0MU10NS, Cat Eye sunglasses The 10NS is an iconic Miu Miu style the Noir. Lens ColourGrey Gradient. Need to know which style of sunglasses best suit your face shape?. Looking for the latest designer sunglasses?. BALMAIN Designer Cat Eye Sunglasses. Style: Cat Eye. Made in FRANCE. Original price: £299.00. Lens: 59mm. Bridge: 15mm. Arm Length: 140mm. Bvlgari Sunglasses BV8201B 536213 Havana Fade Brown Brown Gradient is inspired by a dazzling new Bvlgari ring design that is incorporated into the temple hinge. Dazzling Austrian crystals give a truly luxurious sparkling finish to this slim feminine frame. Model: SMU 10N. Miu Miu Cat Eye Sunglasses With Soft Pink Case & Bag. Gender: Female. Condition: Sunglasses are used and are in excellent condition with very few signs of wear, the lenses are in very good condition. TOM FORD Lily Cat Eye Sunglasses Model: FT 0430 59G. Model No: FT 0430 59G. Lens: Brown Gradient. The History behind Tom Ford: Tom Ford, arguably the most powerful man in fashion, originated from Gucci. Prada Sunglasses Cinema Evolution 53SS UFV3C2 Grey Gradient Dark Grey have a unique geometric shape with cat's eye lift to the corners, one of the frames that is leading the trend into geometric unusual shapes right now. The thick plastic front frame blends nicely at the cat's eye corners into the metal arms with the metal continuing across the top of the frame and across the bridge in one smooth piece that heightens the luxury feel of the frame. Chloe Sunglasses CE657SR 001 Black Grey Gradient are a chic sophisticated design with typical flair and effortless blend of materials from Chloe. The feminine cat eye shape is classic and we love the sparkly metal temples. Giorgio Armani Sunglasses AR6061 318611 Striped Grey Grey Gradient have a metal & plastic frame which is a cat Eye shape and is for women. Tom Ford Sunglasses 0574 Mia 01T Shiny Black Bordeaux Gradient are stylish oversized cat eye sunglasses for women. The slim metal temples and bridge are a contrast to the thick plastic front and the Tom Ford T wraps around each corner to provide instant brand recognition. This chic look is perfect for all day wear as the plastic temple tips provide added comfort and adjustable nose pads ensure a personalised and secure fit. Roberto Cavalli Sunglasses Giunchiglia 670 83Z Pink Gunmetal Burgundy Gradient is a lovely cats eye shape which is quite unusual for Roberto Cavalli, normally big opulent frames. The textured metal arms carry on onto the front frame across the corner and tapers to a finish before the bridge. Temple tips match the colour of the front frame in a nice finishing touch, a true mark of quality. Highly Trendy Celebrities favourite illisteva Marianne Sunglasses Founded in 2010, Illesteva glasses are handmade in France and Italy, in concert with the world's leading manufacturers of luxury eyewear. Illesteva uses materials like acetate and titanium with design of each frame. Pictured are the Illesteva Marianne in Grey with Grey Flat Lenses. Acetate / Stainless Steel CR39 UV400 Lenses Handmade in Italy Style no: MRN4F PERFECT CONDITION!!!!!! Polaroid Sunglasses 5015/S BMB IX Black Rose Gold Grey Gradient Polarized have a very modern look with the vintage inspired cat eye shape being given a contemporary finish with the sleek metal arms. Polarized lenses which are Polaroid's forte will remove the glare that makes your eyes uncomfortable in bright sun and will fully protection you from the sun's UV rays. TOM FORD Valesca Cat Eye Sunglasses Model: FT 0555 52F. Model No: FT 0555 52F. Lens: Brown Gradient. The History behind Tom Ford: Tom Ford, arguably the most powerful man in fashion, originated from Gucci. Prada Sunglasses 09QS 2AU6S1 Havana Brown Gradient are described as an aviator style but these are about as far as you can get from a classic aviator as you can get whilst still maintaining the rough shape. The metal brow and bridge bars are matched with the metal temples featuring the Prada logo but the real stand out feature are the wide, cat eye style frames which scream wear me if you dare!. N ew Yohji Yamamoto Sunglasses. Tiffany Sunglasses TF 4159 82749S Black & Crystal Blue Azure Blue Gradient are a luxurious cat-eye acetate style with Tiffany blue accents. The flat metal temples feature diamond point which is the new symbol of contemporary luxury and inspired by Tiffany's Home & Accessories collection. TOM FORD Sunglasses TF577 Diane-02 (01B) Black . Dispatched with Royal Mail 1st Class. Polaroid Sunglasses PLD 5015/S LYK WJ Black Rose Gold Grey Gradient Polarized have a very modern look with the vintage inspired cat eye shape being given a contemporary finish with the sleek metal arms. Polarized lenses which are Polaroid's forte will remove the glare that makes your eyes uncomfortable in bright sun and will fully protection you from the sun's UV rays. Michael Kors Sunglasses Abela III 6040 3129/11 Black White Grey Gradient are a round frame with a cat eye lift to the corners and a nice round MK logo on the thin metal temples which are matched at the bridge. Studs on the inside bridge area of the frame also give a nice little detail for the Michael Kors sense of class and sophistication. Model Number: GM 684 BLK-35. LADIES DESIGNER SUNGLASSES. Colour of case may vary. Optics by C arl Zeiss Vision. Get images that. make Supersized seem small. We buy in huge quantities, this enables us to pass on our savings directly to you. Dior Sunglasses Dior Sight2 REY 72 Matt Dark Blue Havana Brown Gradient have a flat thin metal front in a wonderful geometric shape with a cat eye lift to the corners. 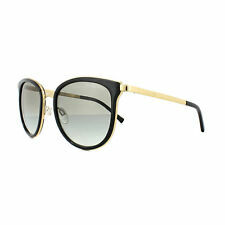 Acetate temples featuring the Dior logo add class and comfort to these modern sophisticated Dior sunglasses.